"best cannabis variety for severe pain with happy, motivational and energizing effects and at certain medication levels, a very creative side"
The F1 cross (UK Cheese x Brazilian sativa) originally our breeding project began to make use of and help preserve the well-known Exodus UK Cheese clone-only strain. Exodus "UK" Cheese is an old school elite variety from the original Skunk #1 family, circa mid to late 1980s. She has a very interesting for many reasons from pure stank, flavor and happy effect but she also has a varied and sometimes debated history that spans across several parts of the world. A true-breeding female Skunk #1 with Colombian, Mexican and Afghan heritage. One folklore story says that a clone of the Exodus UK Cheese was smuggled out of Luton, England... inside a carry-on McDonalds salad, on a flight to Hawaii where she then was only a short hop to the mainland USA where she then spread throughout the underground grower networks for at least two decades and still today... obviously airline security was much less intrusive in the mid 1980s. The Exodus Cheese plant is beautiful and she is a true-breeding female which means she cannot hermaphrodite to produce viable seed, a very stable and pure skunk plant. Almost every hybrid variety has skunk in it today, but not in the pure form we are offering you with the Moon Cheese F2 seeds. Exodus "UK" Cheese is known for completely absurd skunky, stenchy undertones that can travel distances like deep bass from subwoofers, yet also has a berry, fruity pebbles, fermenting fruit, and hospital cleaner type odor that is quite intriguing. A very happy, upbeat buzz that is undeniably very popular with women. Exodus UK Cheese also gains attention from being mentioned in rapper song lyrics such as Redmans track "Sour Deezal" and a few others. The real Cheese is unique enough to be memorable your entire life. There are many "Cheese" hybrid mixes available, but there is only one original clone-only cut and the reason she is the foundation of our breeding projects. You can easily do a web search on "Exodus UK Cheese cannabis" to find out more wild legends of this famously rare cannabis elite variety. So, with the goal also being to correctly breed a stable line of medical cannabis skunk seeds, we decided to use a sativa dominant Brazilian male from the original White (aka Black) Widow creator, Shantibabas expansive genetic pool. This Brazilian male is known to be desired genetics to use for more predictable breeding purposes with knock-out potency... we found this to be fully true. Famously strong seed lines like Great White Shark, Medicine Man, Nevilles Haze, Super Silver Haze and others have resulted from using these same parental Brazilian genetics. In the fall of 2010 FSR planted 35 of the resulting F1 seeds and immediately a group of fast growing males and females sprung up. Upon closer examination there was found a robust female growing with the vigor of top 5 speediest male plants. This female seedling had a unique look with very thin leaves and a noticeable blue color. Over the next few weeks she continued to outgrow every other female and a vast majority of the males..... can't say we have ever heard of a female out-growing males that easily, we soon were to realize she was something special. When that original F1 group was flowered, she was the obvious winner in size, taste, production and the speedy sativa effects really were different than your average commercial indicas found at the Seattle shops. Amazing for pain and mood in bud form, yet not tiring. In fact she is morning-time motivational medicine of the highest order. FSR breeders wanted to give this dominating plant a name and came up with "Moon Cheese". We were "over the moon" excited about finding this miracle pain-reducing plant and thought the name fitting. Over the next 3 years Moon Cheese F1 continued to amaze with the ability to completely stop pain and get folks off narcotic medications. 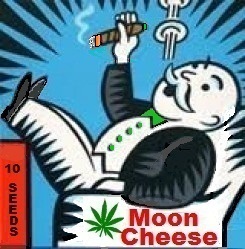 Moon Cheese F1 was great for making Rick Simpson Oil, providing 65 grams of pure THC oil per pound of dried flowers. Amazingly-potent medicinal oil, intended only for patients with a severe chronic pain condition, depression, neurological disorder and many other major diseases. One other thing, the Moon Cheese F1 plant has an unbelievable flower-to-leaf ratio. She's the easiest and quickest plant to trim we at FSR have ever seen, making harvest time a celebration rather than a chore. The thin sativa leaves are few and really allows for good light penetration into the canopy during the flowering phase. The original UK Cheese mother is known to have darker green leaves when compared to other varieties. The leaves of the UK Cheese also has an irregular double-serrated edge, vertical purple stripes on her main stems, purple leaf-petioles and a very unique odor. All of these traits were used to track down the ideal male and luckily we found him. A vibrant male that was identical in appearance and odor to the elite, clone-only Exodus UK Cheese famous among cannabis enthusiasts for decades. Very excitedly, a cross-pollenation of the 2010 F1 "Moon Cheese" and this 2013 F1 "Cheese male twin" was made, resulting in the Moon Cheese F2 seed line... these exact seeds are available from FSR as "Moon Cheese F2". Fresh viable and easy to grow your own medicine. Thoughtful plant breeding takes time, a good eye for desired traits , space, precise labeling and patience.... sadly it seems folks nowadays will cross anything and give it a cute name just to make a buck. That is the exact reason we decided to preserve these genetics keeping them pure and strong in a world of imitations. Every female from the F1 to the F2 generation has been potent and grew with vigor and nice production. There have even been surprises such as purple pistils on the one we call Moonberry Crunch and uncommon podular flower structure that results in plump buds appearing to be seeded yet are pure sensimillia, such as with the Moon Cheese F1 clone only plant. FSR had a 4 year project resulting in the Moon Cheese F2 seed line was a great success and we will have a feminized version of Moon Cheese available soon due to many requests. FSR takes pride in legitimate elite genetics. We used genuine Exodus "UK" Cheese in our breeding program and the best Brazilian sativa male available. We took no shortcuts in the process and humbly pass our years of skunk expertise on to you the patient. FSR will proudly put the Moon Cheese F2 seeds up against all challengers in the "pain reduction" and "highly motivational" categories. No stoney fog, couch-lock or hunger pangs with this unique sativa dominant hybrid, quite different from the commercial indicas that folks everywhere know all too well. We are based in Seattle, WA. USA - working for folks in medical need. Attached photos: First photo is of the mother Moon Cheese F1 the rest are of Moon Cheese F2 plants grown from FSR seed stock.